Great Growth Charts for Kids | Breezy Mama Breezy Mama - Expert parenting advice, celebrity interviews, product reviews for kids, moms and babies and more! Nothing makes time fly like having kids. It feels like I was giving birth yesterday, but bam, another year just went by. Make sure to keep track of all that growth on one of these fantastic charts. Yes, pencil on the door jamb is very 1950’s, but these are too cute to pass up. And, unlike the door jamb, you can take it with you if you move. . . This shabby chic-ish chart comes in this adorable poppy color, as well as azure blue. Hand pulled screened in England, it has both metric and standard measuring, so you’ll learn something at the same time! Bold and Noble, $67.00. Click here to purchase. Does your little boy long to be in outer space? This chart will keep track of how fast he’s growing, showing him that he’ll be reaching for the stars in no time. 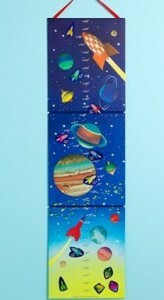 (And speaking of outer space, have you checked out our space kid’s room decor?) Waste No Space Growth Chart by Land of Nod, $19.95. Click here to purchase. Who’s as tall as a giraffe? This is a peel and stick mural, which is easily removable and reusable. And the animal theme couldn’t be cuter. 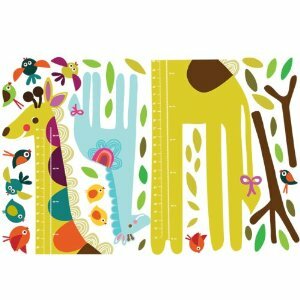 Wallies Peel and Stick Wall Play Giraffe Growth Chart Mural, $21.99. Click here to purchase. I love the simplicity of the big numbers on this gem. Perfect for the modern nursery. The chart has a strip of white vinyl down the middle so that you can mark the progress of your child’s growth with a sharpie–perfect for those not willing to give up the pencil in the door jamb habit. 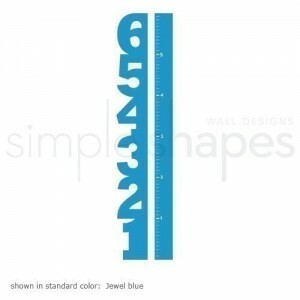 Growth Chart Numbers – Children’s Vinyl Wall Decal, $65.00. Click here to purchase. For both pirate and beach lovers alike, this growth chart is perfect to cheer up any room. Can’t you see yourself saying, “Arrrrr Matey, you grew yourself 2 inches!”? 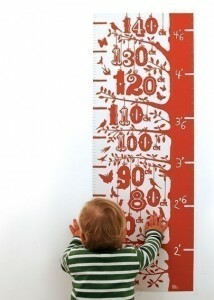 By the Sea – Boy – Growth Chart, $49.00. Click here to purchase.